The surname was recorded in Dumfriesshire where they were seated in both Dumfries and south of the border in Cumberland where the name was more commonly spelled Harstan or Harston. Dumfries and Galloway were created in 1975 following the merging of the countries of Dumfriesshire, Kirkcudbright and Wigtownshire. Covering an area of 2,510 square miles and with a population of 150,000 its adminstrative center is the town of Dumfries. The main products from the county are horses and cattle (for which Galloway is particularly famed), sheep and timber. The physical features of the include Solway Firth, the Galloway Hills, Glen Trool National Forest Park and Ruthwell Cross, a runic cross dated from about AD 800 at the village of Ruthwell. The southern coastline on the Solway Firth, is known as the Scottish Riviera because of its mild climate. The port of Stranraer provides the shortest sea route between mainland Britain and Northern Ireland. Dumfries, Virginia, the site of this years reunion, was named for the town in Scotland called Dumfrieshire (Where Peter, The Immigrant, came from). Thus, "We've Come Full Circle." 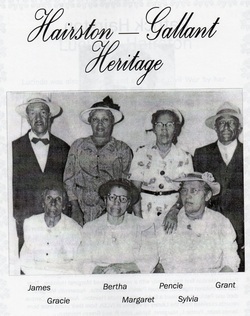 According to a June 16, 1996 article in the Martinsville, ....There are two branches of the family's descendants: the black "Hairston Clan" and the white Hairston family, which pronounces its name "Harston" although there are exceptions by region as to how the name is pronounced. One group is descendants of the plantation owners; the other of the slaves that worked those plantations. This is an attempt to look in the lives of the slave descendants and the life they lived. You will see excerpts from plantation records, Census records, and other documents. This name originated either in England, Scotland or Wales. The Gallant surname was recorded in Surrey where they were seated from very early times and were granted lands by Duke William of Normandy, their liege Lord, for their distinguished assitance at the Battle of Hastings in 1066 AD.